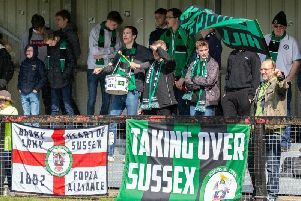 Burgess Hill Town suffered their second consecutive 3-0 defeat away from home as they lost to Corinthian Casuals. Simon Wormull's side lost 3-0 midweek at Leatherhead. Warren Mfula gave the Casuals a seventh minute lead before Hamilton Antonio made it 2-0. Hannigan made it 3-0 to complete a bad day at the office for Wormull's side. Haywards Heath Town continued their good run of form with a 2-2 draw with Phoenix Sports. Andrew Dalhouse gave Heath the lead but went behind until Lewis Finney equalised in the 76th minute. In the SCFL, Hassocks enjoyed a 3-2 win against Lingfield while St Francis Rangers' match with Sidelsham was postponed due to a waterlogged pitch.